A balanced approach to investments will keep you from putting all of your retirement eggs into one basket. 3. Do I Need to Report the Dividend Income on My Roth IRA? Many of the challenges you face to make retirement savings last for your full post-working life are the same for taxable accounts and tax-qualified retirement accounts. 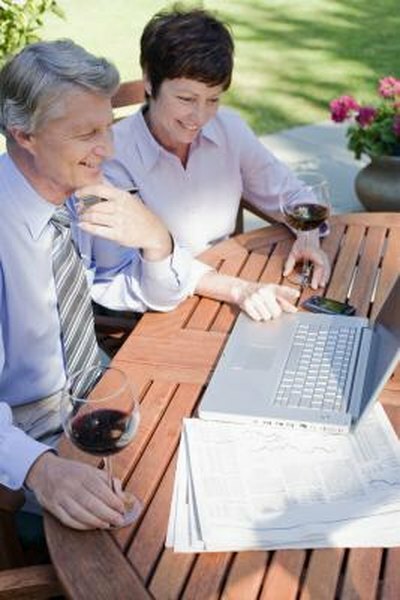 With your retirement money in a taxable account, you have some advantages compared to the same amount of money in the typical tax-deferred retirement savings account. Reducing your tax bill each year can help your retirement account stretch further. With a tax-qualified retirement account, you pay no taxes on your contributions or earnings unless you take withdrawals from the account. When you do draw money from a tax-deferred retirement account, usually the full amount of your withdrawal will be taxable income taxed at your marginal tax bracket rate. With a taxable account, you must pay taxes on dividend and interest earnings, even if you leave those earnings in the account to compound the growth. However, you can take advantage of investment-related tax rules, such as lower tax rates on qualified dividends, long-term capital gains and tax-free municipal bond interest. Interest from bonds and stock dividends are the traditional sources of income from an investment portfolio. Bond interest provides a guaranteed flow of income with rates based on the market interest rates in effect when the bonds were purchased. Stock dividends are not guaranteed. However, dividends can provide a cushion against inflation if the stocks owned are ones that have histories of steady dividend increases. If you can generate enough portfolio income to cover your retirement expenses and the taxes due on that income, you have a stable, self-sustaining retirement investment portfolio. If your taxable retirement savings account is not large enough -- or interest rates are not high enough -- to generate the after-tax income you need in retirement, consider increasing the proportion of stocks in your retirement account. Stock investments can go up in value and pay dividend income. You can sell appreciated stock shares to provide a portion of the income you want from the account. If you sell less than the amount the account appreciates during the year, your retirement savings can continue to grow. You can purchase special investment products or securities with your taxable retirement savings that can help stretch your retirement dollars on an after-tax basis. If you are in a high tax bracket, especially combined with a high state income tax rate, municipal bonds pay interest that is tax free. The interest is also exempt from state tax if you buy bonds issued in your home state. Another tax-advantaged investment comes from the type of company shares known as master limited partnerships, which typically pay high dividends that are not reportable as taxable income. Investors in an MLP are treated like business partners for tax purposes, with a pass-through of income and deductions; with many MLPs, the deductions exceed the reportable income. MLP shares can make tax reporting more complicated, so do your homework before investing. An immediate annuity is a contract with which you buy a guaranteed monthly lifetime payment in exchange for a lump sum payment to a life insurance company. When purchased with after-tax dollars, a significant portion of the annuity payments you receive are not taxable. You could use a portion of your retirement savings to buy an annuity to give yourself a base level of low-tax income that you know will last as long as you do. Does Selling Stocks in an IRA Count as Income?